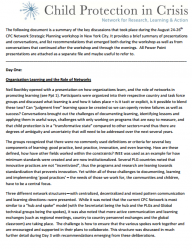 The following document is a summary of a three day strategic planning workshop for the CPC Learning Network that took place during August 2011 in New York City. The discussions include topics such as organizational learning, how the Network could best support the respective learning needs of partners, and how to best link global and country-level learning together. It provides a brief summary of presentations and recommendations that emerged during the workshop.